When I was in France I found these really neat scissors, they can do the work of five! I was at a street market and found several of these with the kitchen wares vendors. 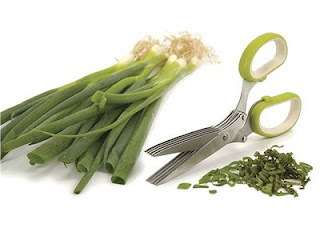 Very usefull for cutting up chives, green onions or any herbs that need a quick cut for garnish or taste. These are the five blade ones, I have seen some with as many as eight blades, although I dont know what you would be cutting eight of? Maybe cole slaw?